labor by the manipulation of loads and by forced postures, limiting fatigue or musculoskeletal injuries. In a first phase, they will be employees of the logistics section of their stores in Badalona (Barcelona), San Sebastián de los Reyes and Vallecas (Madrid) who begin to test this technology, which makes the company a pioneer within its sector, as announced on Tuesday. The workers will use the mechanism in their day to day for six weeks, during which time they will have a follow-up by the medical team of each store to document their evolution and physical performance. 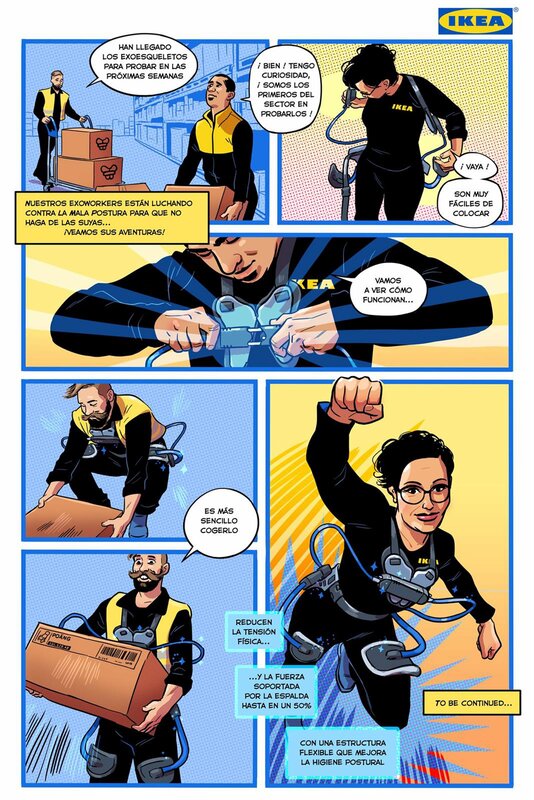 After this pilot phase, the results, its functionality and the real benefit it has for the Ikea staff will be evaluated and, if favorable, will be extended to the rest of the company's stores and units in Spain. The exoskeleton is a portable back support designed to assist users while working in a forward bending posture or when lifting particularly heavy objects, reducing physical strain. Thanks to its mechanism, the force applied in these movements is diverted towards the upper part of the legs and its portable frame supports part of the weight of the user's body, which decreases the tension in the back. It is estimated that all this reduces by 50% the activity supported by the muscles of this part of the body, which means less pressure on the vertebrae and less risk of injury. To announce the start-up of this process, the company has presented a campaign in which it presents three of the first employees to use this technology as comic book superheroes who fight against The Bad Posture. Next Luis Garicano: "Routinizable jobs are at risk"